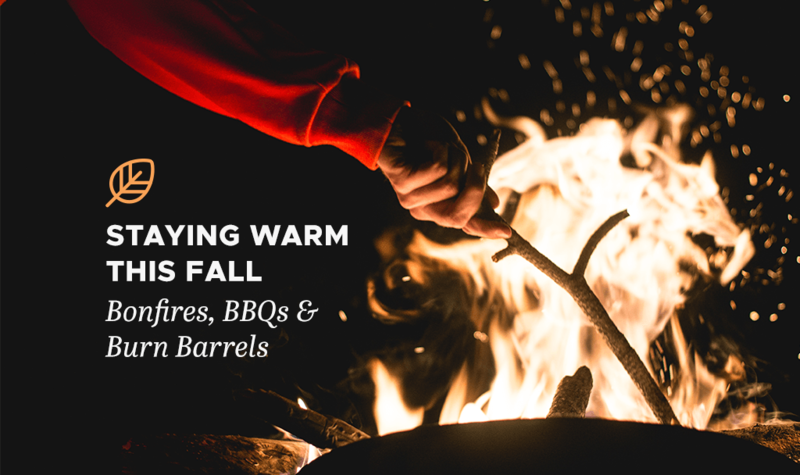 Staying Warm This Fall: Bonfires, BBQs & Burn Barrels - Jeff Munns Agency, Inc. The brisk yet refreshing temperatures, the crackling from the fires, and smiles shining ear-to-ear. We’re talking about Fall, of course. It’s here and it’s a great time for outside activities – especially before winter hits! Grilling, burn barrels, and bonfires light the enjoyment into the night, bringing family and friends closer together. Unfortunately, with all that fire and heat – there are always safety risks. Ensure your grill is set away from your home, garage, eaves and overhanging branches. Check grill gas tank hose for leaks before using. Avoid moving a hot grill. Keep grill clean; remove grease/fat buildup. Keep children and pets safely away from grill area. Make sure your outdoor gear (furniture, tools, mowers, etc.) is located at a sufficient distance from the fire. Do not use accelerants to start a fire. Avoid wearing flip-flops/walking barefoot near the fire. Pay attention to wind direction and strength. In the case of any accidental damage to your property – or your neighbors’ – please refer with your local insurance agent for any potential policy coverages. Safety information provided by Auto-Owners Insurance. The informational statements regarding insurance coverage are for general description purposes only, not legal advice. Read our disclaimer. © 2018 Jeff Munns Agency, Inc.